The theme of smallness keeps presenting itself to me lately. The Tiny Habits course I wrote about here started out with just the smallest steps towards the creation of a habit along with a small, or tiny celebration. Months later, I am still doing my “tiny” habits and they’ve grown. In another book I’ve just finished called “Designing Your Life,” designers introduce the concept of prototypes suggesting that we make small prototypes of our lives before we make big decisions. Sometimes a small, but subversive choice is also an act of hope. I think maybe the more stuck you are, the smaller the act can be and the more impact and ripples it will have. You can get out of bed when it’s hard and make yourself a cup of tea. Someone once told me when I was making a to-do list as a new widow that planning is a form of hope so yes, you can make plans for something in the future or even make a to-do list for today. You can take a photograph of something beautiful but imperfect—a broken snowflake or bare tree branches. You can buy fresh flowers for your house, take a walk at your own pace, or send someone a handwritten card to brighten their day. Don’t discount their power just because they’re small acts. I admit, by the snowstorm this past Tuesday I was feeling winter-weary. The combo of Daylight Saving Time disrupting our sleep schedule and another long day at home made the impending snow day feel a little less fun than the previous one. The snow wasn’t great for sledding and listening to the sound of the wind and the ice against my windows, I couldn’t bring myself to even venture out. But something we’d done the night before made Audrey and I smile. We have at least two resident chipmunks—one has a hole by our driveway and another has a hole right outside Audrey’s bedroom window that he often peeks out of. Knowing they were about to be blanketed with inches of snow, we took some of our birdseed to each hole and dropped it in. Now, I really don’t know if the chipmunk slept through the whole storm or had plenty of food stored away, but we imagined him finding it with surprise and it brightened our day. As I’ve mentioned before, Audrey loves to make tiny, encouraging notes and leave them around the house for me. The picture I’ve used here is a larger sign she made one day when she was bored that now hangs in our kitchen. 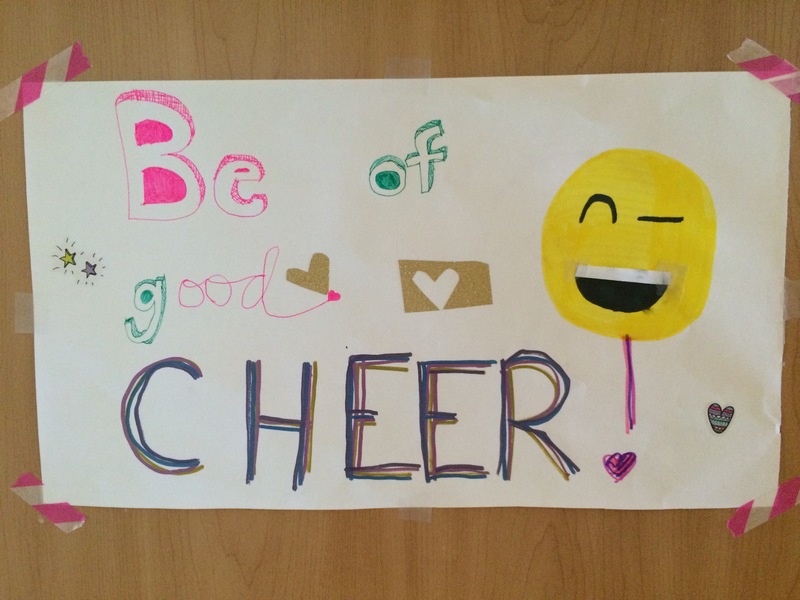 Making these signs and notes is one of her acts of hope. Some days, especially on the particularly overwhelming ones, I’ll go set up my daughter’s dolls so it looks like they’re having a snack or playing spa so she’ll find them when she comes home. By the time she discovers them I’ve forgotten about it, and her delight lifts my own spirits. On weekends which are sometimes lonely for me I throw out birdseed in the morning and watch the little black eyed juncos with their bright beaks and dark eyes that make them look always slightly befuddled—gather around our steps. For me, writing words is also a slightly subversive act of hope, especially when I’m too busy and it seems like a waste of time, or when I feel generally terrified to put my words out into the world. Lent is a good season for these acts of hope because in my mind, these acts go along with the Ignatian principle I’ve also mentioned before, here and here: Agere contra- to act against. It’s not about puppies and rainbows and hearts (though it is about chipmunks! ); it’s really about flexing your hope muscles against a backdrop of dull despair, boredom, loneliness, or overwhelm. An action going “against” your inclination to hide under your covers all day will be much more powerful than if it’s done on a day that you feel like singing about how great life is. I always think of March as a fight since a Lithuanian friend told me years ago that’s what it means in her language. I think a month like March (not to mention the times that we’re living in) needs a few more of these small but subversive acts of hope. I’d love to hear some of yours. I am eagerly awaiting our little chipmunk to wake up this spring. My act of hope was to spread peanut butter on dried corn cobs, roll them in mixed seed, and hang them outside for our feathered and furred friends. Justin’s birthday is this Sunday, he would have been 32. Thank you for the reminder that getting up is an act of hope. Wishing you a peace filled day.